Oil-Free, rapidly absorbs excess oil and controls shine without a powdery finish. Soothes, protects, and freshens your face. Easy to take out design, ensure you One Piece One Time! Avoid the unnecessary waste and keep the tissues much clean than the traditional take out design. Both female and male can use, works friendly for makeup skin or without makeup skin, also ideal for sports people, thus could be very nice gifts or share with others. Made of 100% Natural linens with Organic Bamboo charcoal factor, soft and gentle. 10cm large size paper, works on both sides for cleaning entire face in just one sheet. Elegant and exquisite package( size: 8.5x6.5cm), easily put it into your purse or pocket, say Hi to a Pretty you every time you open it! 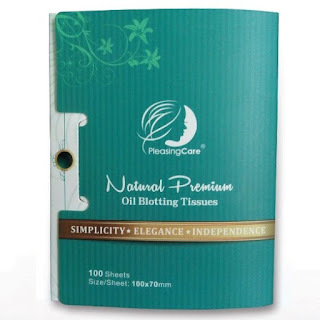 Pleasingcare's Natural Bamboo Charcoal Oil Absorbing Tissues are great! I love carrying these in my purse. They are so handy and easily removes excess shine from your face. Living in Arizona I can't even get out the door without my face looking shiny so I love to use these to blot away the excess shine. I use them several times a day and they really help keep my makeup fresh and I've noticed I have less breakouts because the oil isn't sitting on my face all day clogging my pores. I love that they are made from natural organic bamboo charcoal and that they are soft and gentle and large enough that it only takes one sheet to do the job. These work great and I highly recommend them! Check out my EasyFace Sonic Face Cleaning Brush Review!